As one of the true masters of drumming, Rick Latham literally wrote the book on funk drums in his classic Advanced Funk Studies. 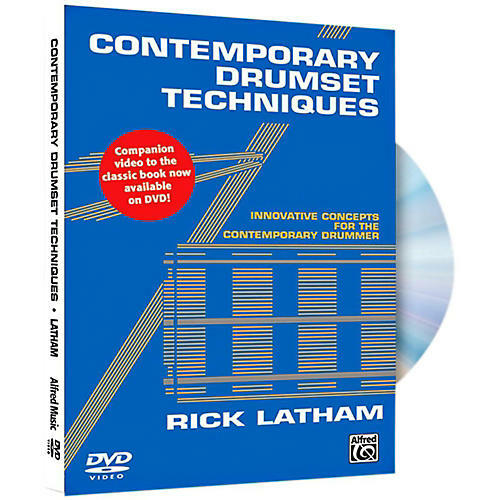 His second release, Contemporary Drumset Techniques, is one of the most complete books on linear drumming techniques available. Filled with hundreds of exercises that can be easily incorporated into your playing, Contemporary Drumset Techniques has proven to be an invaluable drumming resource. This companion video to the book guides you through rudiments, interpretation, triplet exercises, foot substitutions, hip-hop patterns and many other fascinating topics. Watch Rick Latham bring the topics covered in his landmark book to life by personally demonstrating techniques and exercises. Included are five full-band showcase performances that provide real-world examples of the concepts covered in the video. These performances combined with Rick's teaching result in a DVD that will impact your drumming forever.